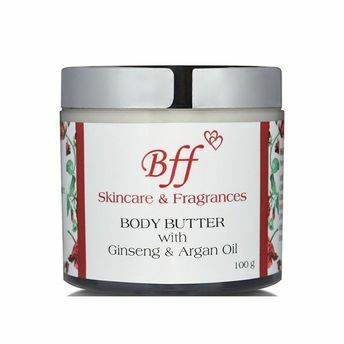 Pamper yourself to obtain a flawless glowing skin with BFF Skin Care's Body Butter. This body butter removes various kinds of skin problems and provides radiant skin. Infused with Ginseng & Argan Oil it tightens skin and gives it a naturally healthy shine. This body butter is a must have for mature skin! Ginseng: High Concentration of Antioxidants. Promotes skin cell regeneration. Argan Oil: Argan Oil is the Most sought after ingredient today in skincare products, with healing, nourishing & regenerative properties.